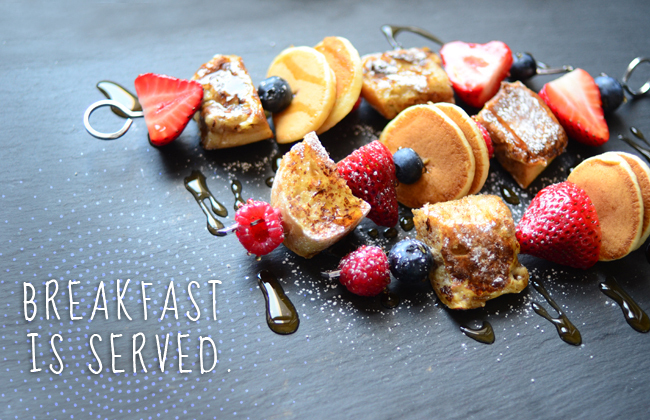 There's no denying that breakfast is the greatest meal of the day. 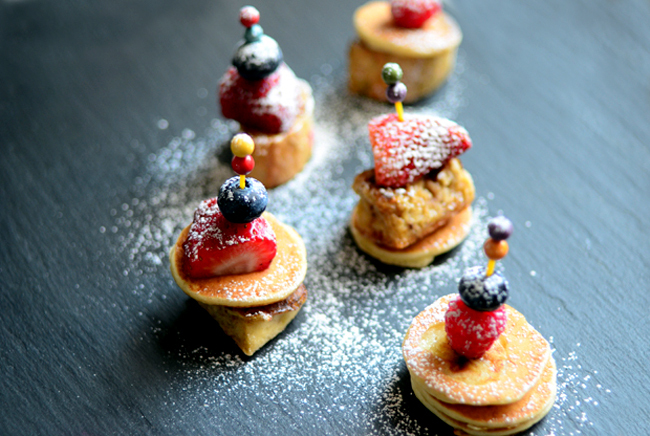 Of course you could try, but what's more special than the ritual of weekend pancakes and french toast? Taking the extra couple minutes to serve pancakes or french toast is thoughtful and tasty, but lately I've been a little bored with the pancakes I love so much. I started asking myself, how can I make breakfast more creative? 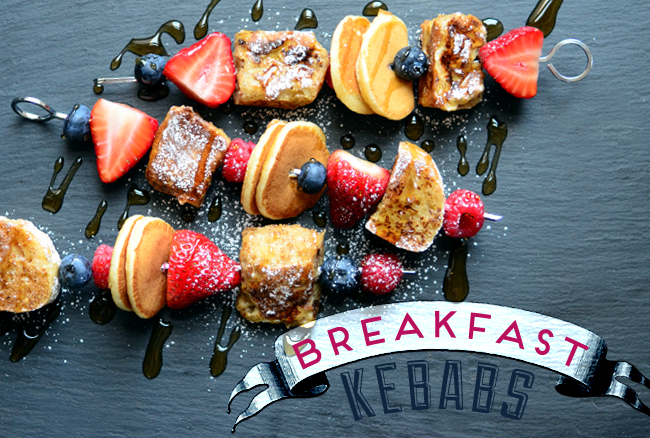 Breakfast Kebabs! They are fun to eat and perfect for entertaining. 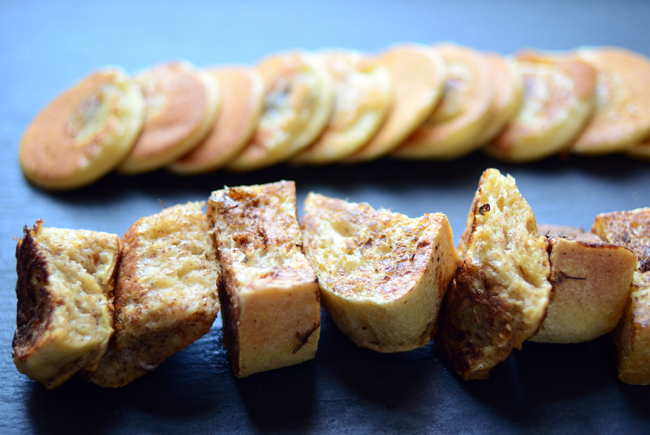 Plus, it allowed me to make miniature banana pancakes and french toast bites, which I obviously loved! Whether you're entertaining friends for brunch or seeking a creative Sunday breakfast for your family, make these simple breakfast kebabs and you just may never go back to cereal again. 1. Combine all the ingredients in a medium-sized bowl and whisk until all the lumps are gone. 2. Lightly butter a nonstick frying pan and place over medium-high heat. 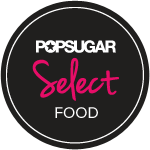 Use a teaspoon to spoon batter onto frying pan and quickly top with a banana slice. 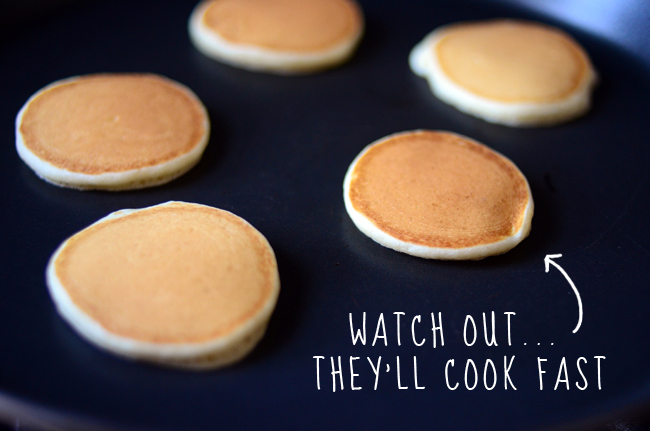 Flip after about 20 seconds, or when several bubbles have formed in the batter. Cook on the other side for another 30 seconds, then set pancakes aside until assembly. 1. 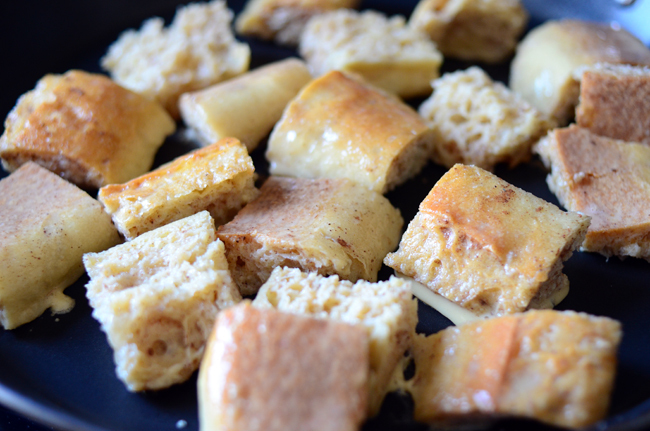 Cut bread into 1-inch cubes. In a bowl, beat eggs, milk, vanilla, cinnamon and salt. Add bread cubes and mix to saturate. 2. Lightly butter a nonstick frying pan and place over medium-high heat. Remove bread cubes from egg mixture, shaking off excess liquid. Cook until all sides of the bread are golden brown, about 5 minutes. 3. Sprinkle the French toast cubes with powdered sugar and set aside until assembly. 1. Wash fruit and half strawberries. 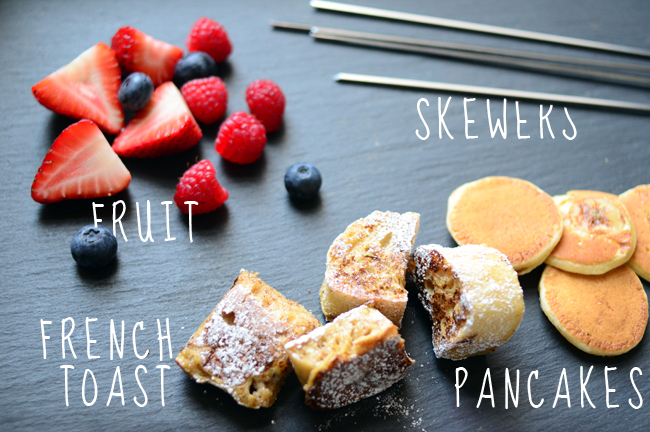 Thread fruit onto skewers alternating with french toast cubes and pancakes. Dust with powdered sugar and serve immediately with maple syrup. 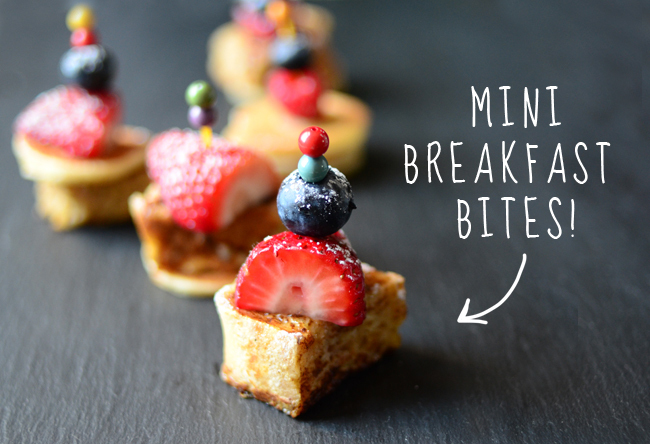 If you're breakfast needs to feed a crowd, swap the skewers for toothpick and make these breakfast bites. 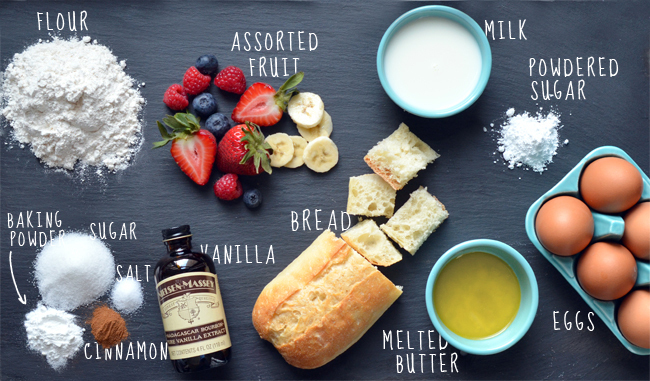 The ingredients may be simple, but they certainly look fancy. And if you want to upgrade the syrup, try dipping them in melted chocolate or honey sweetened greek yogurt. How far ahead can I make the breakfast bites? Do they need to be served soon after making? Hi! I wouldn't make them more than an hour or two in advance. But you can prepare all the fruit and batters in advance. Once you make the bites, keep them warm in the oven at 200 degrees. Hope that helps!